In the vanguard of the New German Cinema which came to the fore in the late 60s – think French New Wave minus the French – and able to cite the likes of Rainer Werner Fassbinder, Volker Schlondorff and Wim Wenders as contemporaries, Werner Herzog was once called “the most important film director alive” by none other than Francois Truffaut. That’s quite a statement, even from Truffaut, when considering the work produced by the directors associated with NGC has generated Golden Lion, Palme d’or and an Oscar, amongst other things. In the film industry, platitudes are often dished out with little thought and generally for whoever the flavour of the month may be, the word legend the most overused adjective going, but in Herzog’s case, real consideration must be given to him rightfully laying claim to the assertion. Many directors will go off the boil, become obsessed with revisiting past glories or simply fade into the background, wheeled on at awards ceremonies for lifelong achievement stuff, long after their sell by dates. But when he turns 70 in September, if such an award came his way, it would have been deserved. His features career is perhaps best characterised by films such as Aguirre, the Wrath of God, Nosferatu the Vampyre and Fitzcarraldo, for which he won Best Director at Cannes in 1982. Each of those films starred Klaus Kinski, an actor with whom Herzog has a productive though, to say the least, fractious relationship. Herzog was later quoted on his star “Every gray hair on my head is because of Kinski”, and even made a documentary on their relationship, entitled My Best Fiend. 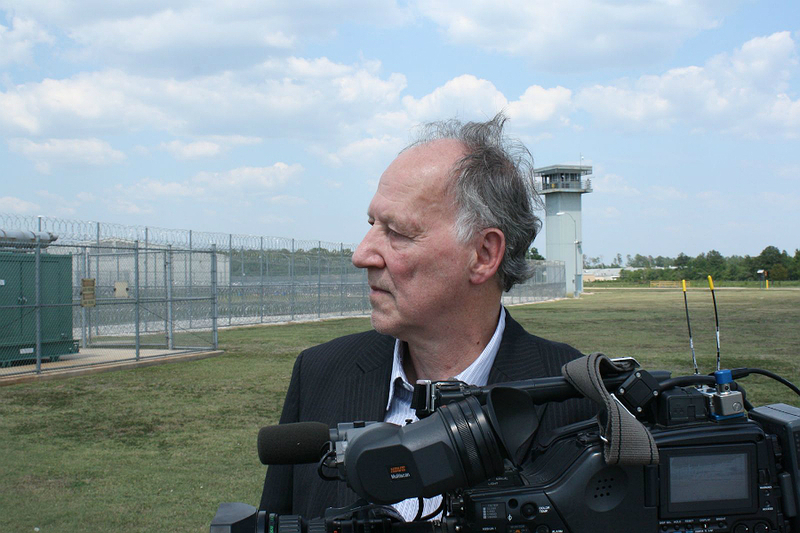 Herzog has won new, and perhaps wider, audiences over the last decade or so with his documentary oeuvre. Films such as Grizzly Man, Encounters at the End of the World, and Cave of Forgotten Dreams, have been quite rightly celebrated for their journalistic qualities, utilising attention to detail and an unerring ability to get to the heart of the matter seemingly as a matter of course. This while maintaining a respectful, almost protective distance from his subjects – as with the deceased Timothy Treadwell, subject of Grizzly Man – marks him out as a filmmaker capable of astounding work without bludgeoning the issues. A study of Herzog, however short, cannot be complete without mentioning the nature of urban myth that surrounds the man. In 2006 during an interview with Mark Kermode for the Culture Show in LA, Herzog was shot at, and hit in the abdomen. Later, back in the safety of a studio somewhere, he confided to Kermode: “It’s not a significant bullet … it’s not an everyday thing, but it doesn’t surprise me to be shot at”. Due to his insisting he didn’t need medical attention, the bullet, apparently remains lodged in his abdomen to this day. But I digress. Tonight, FACT are showing Herzog’s latest documentary, Into The Abyss. A film broadly about capital punishment, it approaches the story of Michael Perry and Jason Burkett -two young men found guilty of three brutal murders – from the perspectives of the victim’s families, prison staff and the realities of time spent on Death Row. The screening is followed by a satellite Q&A with the man himself. Not to be missed.